This sweet little bear is Camelford. 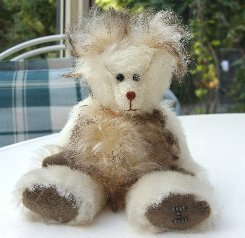 He is 5 1/2" tall and is made of very soft, white German mohair, quite thick and with a very slight wave in the pile. We have combined this for his tummy and ears with really lovely cream backed, brown tipped German mohair. This fur is gorgeous, it is soft and wavy, longer than the white fur with a gentle curl in the pile which shows off the brown tip perfectly. Camelford is one of the latest bears in our new Cornwall Collection. He is filled with steel shot and glass beads so has some weight for his size. His pads and paws are mushroom brown cashmere, he has a chestnut brown stitched nose and shiny black German glass eyes. He is very cute with a sweet face and great ears! I hope you like him, he costs £39 plus postage. Please note that as with all our bears, Camelford is not a toy and is not suitable for children. Sorry - Camelford has been adopted.